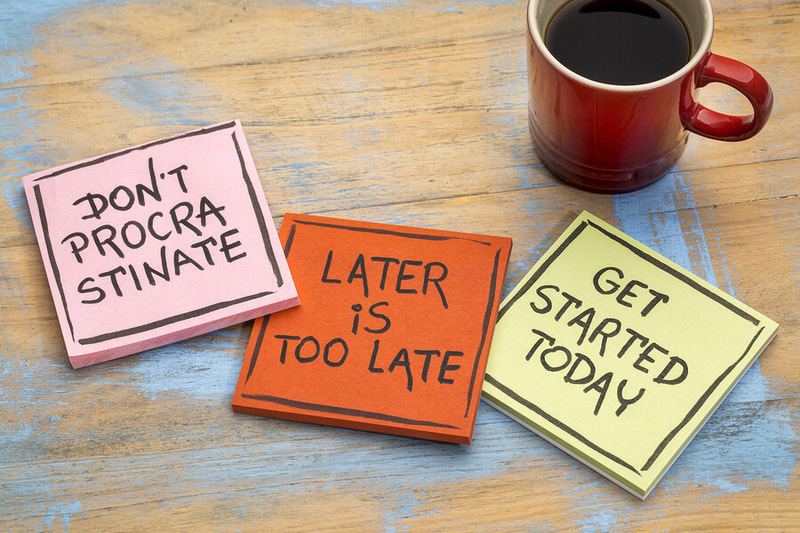 Don't Let Procrastination Delay Your Application for FERS Disability! Are you applying for FERS Disability Retirement? Do you find yourself procrastinating when you think of all the forms and documents you need to gather, complete, and submit? Before you beat yourself up for being “lazy,” consider that there may be an underlying reason for your lack of motivation. I recently had the opportunity to speak with Jane Martinez, LICSW, and she had some very interesting insights about the causes and remedies for procrastination. See if you can identify yourself in the following transcript. Then, try using some of Jane’s suggestions to modify some of your behaviors that lead to procrastination. You’ll be amazed at how easy it is to accomplish large, complex projects (like your application for FDR!) when you’re able to nip procrastination in the bud! Scott: Welcome, Jane! I really appreciate you taking the time to meet with me today. S: Today we’re going to be talking about something that affects everyone to some degree, and that is procrastination. Specifically, we’ll be talking about what procrastination is, why we procrastinate, how procrastination can be damaging, and what we can do to overcome procrastination. OK, Jane, just so we’re all on the same page, how would you define procrastination? J: Well, I believe that procrastination is putting off or delaying something, especially when it comes to something that requires your immediate attention. For example, like getting your taxes done, or filling out paperwork for disability, or cleaning your room. These are all examples of things that might need immediate (or relatively immediate) attention that we tend to delay or put off. S: [Laughs] I especially love the disability-paperwork example, because that is something most of my clients can relate to. Filing for any type of government benefit can be extremely tedious and overwhelming, so it’s totally understandable that the applicant would want to delay action as long as possible. J: Well, in preparation for this meeting, I created a very long list of reasons why people procrastinate. And although I was stunned by the sheer length of the list, I was able to identify one underlying reason that seems to apply universally to almost everyone, regardless of education, profession, etc. And it is this. People fear a change of identity. J: Yes! So, for example, if I complete my disability application, then that means I’m disabled. And I don’t want to think of myself as a disabled person. So, now I have a conflict, which causes me to procrastinate. Here’s a great real-life example. I once worked with a disabled client who was using his rather meager income, not to pay his bills or his rent, but to protect some personal items in a storage unit. And that didn’t make any sense to me. I kept asking myself, why would someone in his position not pay his rent? He could literally end up on the street! Furthermore, he told me that the items in storage had very little monetary value. I was perplexed. As we worked together, however, I learned that the storage items were strongly connected to his sense of identity. You see, before he had become disabled, he had been a very talented sculptor, and his disability (which is physical) prevented him from being able to sculpt. However, he still identified as a sculptor. And because he was hanging on to that sense of self, he was placing his very survival at risk. That’s how strong our resistance to a change of identity can be. S: Wow, that’s almost inconceivable. J: Well, that’s an extreme case. S: So, if someone has the self-awareness to realize that they’re procrastinating about something that needs their immediate attention, is that the first question they should ask themselves? Do I fear a change of identity? You may want to begin a conversation about the difficulty of transitioning from a working individual to a disabled person. Let’s face it. Our country prides itself on the working individual. We have that pull-yourself-up-by-the-bootstraps mentality, and disability is often frowned upon. Therefore, disabled individuals who are very proud of their abilities and work accomplishments have a really difficult time with this transition. S: That’s a great point you bring up, because the vast majority of people I have worked with had been exceptional workers and had excelled in their professional careers before they developed disabling conditions. And even if they don’t say it outright, they often express a sense of shame at no longer being able to work in the same capacity. J: Yes, and deep feelings of pain, embarrassment, and shame often lead to procrastination. Of course, there are other factors that contribute to procrastination. For example, lack of a regular schedule. Sometimes persons who are ill, disabled, or bed-bound for long periods are unable to engage in what they perceive to be a robust, productive life, and they lose their ability to keep a regular schedule. And when you don’t keep a regular schedule, it makes it that much more difficult to plan and execute large, or even modest, projects. Fear of failure is another common factor. People with disabilities often feel a sense of shame and failure, so their confidence is shaken, which makes them question their abilities. S: And you’re saying that the feelings of helplessness, fear, etc. can trigger the behavior of procrastination? J: Yes. “Am I really going to be able to make a change in my life? This is a new avenue for me. It’s uncharted territory. Am I going to be able to navigate this territory?” Rather than face these issues head on, it’s just easier to procrastinate. S: OK, so now we understand what procrastination is, why people procrastinate, and how damaging procrastination can be. How does one overcome procrastination? J: Well, as I just mentioned, the first step is to keep a regular schedule. The next step is to create a space for yourself. Someplace quiet where you can think, plan, and let your creativity flow. In other words, you don’t want to be sitting in front of the TV with ten people in the room, because that will distract you and cause you to procrastinate even more. Once you have a regular schedule and a quiet place to work, the next step is to make a list. The very act of committing your thoughts and ideas to paper will often significantly decrease the anxiety and fear that is causing you to procrastinate in the first place. Once you have your list, the next step is chunking. S: I love chunking [laughs]! J: Yes, chunking is great! Chunking is simply saying to yourself, I will give myself one hour to work on this monumental task, and then I’m not doing any more. And over time, you chip away at the project, and you’re amazed at how much you’ve accomplished. S: Yeah, I’ve found chunking to be an incredible tool, because as someone who has a history of anxiety and depression, I tend to get overwhelmed if I try to tackle a large project in one bite. You use the example of an hour, but I’ll often work in twenty-minute intervals. I find that these shorter intervals allow me to work with razor-sharp focus. And of course, at the end of the interval, I feel a sense of accomplishment, and I’m ready to schedule the next twenty minutes. I’m always amazed at how quickly a project “shrinks” when you implement chunking. J: Exactly! And if you have physical or mental restrictions that impair your ability to focus and concentrate for long periods, chunking can help you feel successful by allowing you to work in small spurts and chip away at a large project over time. Finally, the last step is to reward yourself! For example, “When I finish this chunk, I’m going to let myself watch a half hour of TV, or I’m going to treat myself to a cookie, or I’m going to take a nap, etc.” By giving yourself small rewards, you’re acknowledging your successes, which will motivate you to continue. S: Wow, those are great suggestions – thank you! You know, there’s a lot of talk in the literature about the power of positive affirmation. What is your experience with using positive affirmation to address procrastination? J: Well, I think we in the West come from a society that has a medical model of looking for problems. In other words, we look for what is not right and then we fix it. So, we’re conditioned to focus on what isn’t working well, and this can negatively affect our moods and our ability to cope with adversity. Constantly reminding ourselves of our positive attributes increases our self-esteem, which will ultimately aid us in overcoming procrastination. S: Along those same lines, do you find that the practice of gratitude is helpful? What you focus on is what’s going to create your mood. So, if you’re focused on negativity, you’re going to feel defeated and negative. I’m not saying to be Pollyanna, but if you take a balanced look at the good and the positive, as well as the things that you’re struggling with, your chances of getting through a difficult time or overcoming an adverse situation are much better. S: Well, you’ve certainly given us a lot to think about! I want to thank you for taking the time to share your expertise. J: Your welcome! My pleasure!